If you are a true foodie and tire of the sometimes uninformed user reviews on Yelp and Trip Advisor, then you’ll want to check out forkly’s free social networking food app for iPhone. By blending the strong visual presence of the Pinterest iOS app interface with a sophisticated perspective to restaurants and food, the forkly iPhone app creates a social network of food lovers who eat with their eyes and refined palates. To optimize your forkly iPhone app experience, you must take a couple of steps to establish an account and build your forkly foodie social network. You must activate location services to operate it. You have three options for creating a forkly iPhone app account. With its top billing and largest banner, the recommended social network for sign in is Twitter. Facebook and email account authorization work as well. After you authorize your social network or email, you set up your security credentials for forkly. Then, you move on to the task of creating your forkly foodie social network. You can find friends on Twitter and Facebook. You can also invite contacts. An interesting angle is the ability to locate those around you. In an attempt for social networking iOS apps to bridge your online life and your pounding the pavement life, more iOS apps are incorporating this functionality. Finally, you can select to follow well known media personalities and food organizations like Whole Foods, Iron Chef Michael Symon, and Tori Spelling. The forkly iPhone app interface picks and chooses among many successful, familiar functions and tools. You navigate between your feed, discover, taste & rate, activity, and profile with one touch in a menu bar at the bottom of the screen. Your feed has a strong visual presence with a large photo just like Pinterest. You can “want it,” instead of “pin it.” You can comment on the dish and restaurant as well. With one touch, you can access the restaurant’s details and other restaurant items featured in the forkly iPhone app. When you want to discover new restaurants, dishes, and drinks, you are greeted with a well-organized screen. Since your location services are activated, you can touch the top of the screen to check out any items in forkly. Or, you can check out restaurants and items within five miles of your location. If you are planning a vacation or seeking inspiration, you can also explore feeds with cocktails, breakfast, dessert, and more. You earn points and forkly foodie credibility by commenting, sharing items with the community, and inspiring others. Your activity feed and profile succinctly and elegantly track your impact on the forkly foodie community. Again, this is a common feature of iOS apps focused on building social networks like Fab.com, Schemer, and Chee.rs. You’ll appreciate that the forkly iPhone app pulls your profile picture and biography from Twitter. You can make adjustments in the settings menu, if you want to tweak your profile information. When you create a taste with forkly’s iPhone app, the interface is smooth and intuitive. You select the restaurant from the list generated by location services. Using responsive gesture controls, you touch the screen to properly categorize your food or drink. Then, you enter the item name. You add a photo through your iPhone camera, or you can access the excellent Camera+ iPhone app with one touch. With a nod to Path’s fun emoticons, you choose among a heart, smiley face, OK face, and stay away icon to rate it. The icon resides at the top right corner of the item. 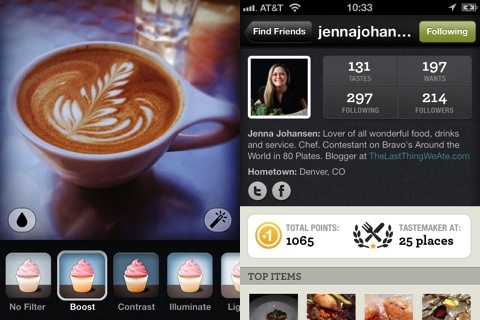 With one touch, you post it to Twitter, Facebook, and forkly’s iPhone app. 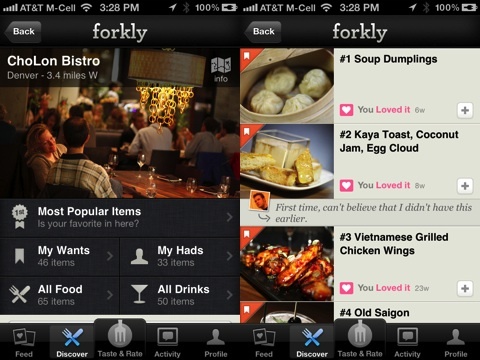 forkly’s iPhone app is an exciting new addition to the iTunes App Store for foodies seeking more than the “Yuck, I hated it. I can’t believe they serve snails!” reviews. AppSafari review of forkly was written by Jenni Ward on July 10th, 2012 and categorized under App Store, Food, Free, Social, Travel. Page viewed 4927 times, 1 so far today. Need help on using these apps? Please read the Help Page.